Can you tell us how you got started in the modelling world? Yes I can, I was at school in Rottingdean a little old village, and I wanted to study art. At that time you had to have 'O' levels in Maths and English, but because I was dyslexic this was a problem. Not that I couldn't do it, it just took me much longer. Art is where my ambition lay, I'm not Picasso but I wasn't too bad. My mum said how about Art School? I said great but I'd didn't get in full time because I did not have my Maths and English, but I did do a part time course which I loved. I was at Art School doing a life class and there was a chap studying photography there, he asked if he could take a couple of photographs of me, so I said of course. Unknown to me he asked my mum if he could send the pictures to a Newspaper where David Bailey was running a competition. Because David Bailey was the photographer of the times, in the late 60's the competition held great credibility, my picture won and I went on and won the 'Face of the Year'. Tell us briefly about your first modelling job? I went for an interview at Lucy Clayton, which was a modelling agency, my first job was for designer Sweaters for America Vogue, and they flew me to Malta. There I was sitting in the sea in a jumper, and that was the beginning of my career, which was way back in 67. Your modelling led to small roles in films such as "Casino Royale"? Can you tell us a little about this? Again it was through the modelling agency, they were looking for girls that looked ok-ish, and I was chosen to be one of the girls to be in the film! I think I was in the back line of the girls. But I was chosen to do the publicity for the film the photographs, so it looked like I was in it but I would not have seen me in it! Is there a particular Actor/Actress who inspired you? I like a lot of the older actors and actresses; I love Rita Heyworth, and actors from the 50's. Also I like a lot of the European actors Sophia Loren. Of the modern day ones I think there is a lot, for screen presence De Niro and Pacino and of the woman Debra Winger, Barbara Streisand as both a singer and actress. You got roles in several Hammer Horror features can you tell us a little about this period in you career and its highlights? It was wonderful, I loved my time with Hammer, I didn't expect it, I went along for an interview, I had just done a poster in England for' Lamb's Navy Rum', . I was part of the 'Lamb's Navy Rum' poster campaign for around 12 years, quite a record for a model to be used in the same campaign for that long. Sir James Carreras saw the posters on Bill Boards when he used to travel down to Brighton on the train. He asked me to go in and do a reading, which I did, which lead me to signing a contract with Sir James and Michael Carreras. 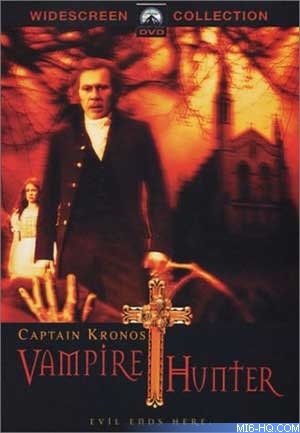 I went on to do two films for them, the first being Dracula AD72 and the second being Captain Kronos Vampire Hunter. It was great because I got a chance to work with good Directors I worked with Alan Gibson I was a little nervous of him because he was a strong director and I hadn't been used to that sort of thing before, I also had the chance to work with Stephanie Beacham and of course Peter Cushing, Christopher Lee, Vincent Price, Michael Kitchen. At the time Michael Kitchen, Stephanie and Marsha Hunt were kind of the brat pack of all new English actors and there was myself who was Cabbage Green, as I had not done much. I was thrown in the deep end but I absolutely loved it. One of my scenes for Drac AD got a round of applause by the cast and crew. That was it; I knew then that I wanted to act. Kronos went on to be very special to me, Carla was a great part .The film has just come out on DVD in England and the States. I did the commentary on the disc with Brian Clements the Director. Is it true that you got to work with George Lazenby? Yes, it was years ago. George and I were both modelling and doing commercial work We worked together on an ad for 'Fry's Turkish Delight' it was shot in Spain and I had to wear a yashmac and George was carrying a box of Frys Turkish Delight, he is a very handsome man, and it was a very romantic commercial. I would love to see it again. The Spy Who Loved Me is seen as one of Roger Moore's finer Bond's. Can you tell us how you landed the role of Naomi? Well, again it's thanks to 'Lamb's Navy', Cubby Broccoli saw me in a 'Lamb's Navy' poster, this time I was in a wet suit portraying a strong image, not the type to mess around. Cubby asked me to come to his office to do a reading. He offered me the job on the spot, I was also offered, at the same time the role of Ursa in Superman, I was told to take Bond. Sarah Douglas got the role as Ursa and was fabulous. My agent said do the Bond, as it was already established, I was very lucky; it was a wonderful opportunity to be involved with Bond. To be working with great people like Lewis Gilbert the Director and Claude Renoir the DP and of course Roger, who was a joy, very cheeky and naughty but we loved him. Can you tell us how it was working with Roger Moore and any fun stories from the set? It was a really funny experience working with him. He is super professional I was a bit nervous when I started but he made me feel totally at ease. He used to have lots of one-liners. I was fine with it. I loved his sense of humour and would love to work with him again. Could you tell us of one of your fond memoirs from The Spy Who Loved Me? It was just a delight to work on, Richard Kiel and I were asked to do the publicity for the film in Europe and some in the States. The European experience was wonderful, they flew Richard and his wife and I first class to all the cities in Europe to promote the film and I remember every time we would set off the plane Cubby would give us Five Hundred Pounds! Back then that was an absolute fortune, we would ask "what's this for" and he would say just for being here. Cubby did things in such a classy way, he was a mountain of a man in every way, and he made you feel very special. I think working on a bond film is a great honour and you carry the mantel were ever you go. Barbara Broccoli has done such a wonderful job of carrying the mantel on, he would be so proud of her. How did your image as a "Bond Girl" affect your career post 1977? Being involved in a bond film opens doors for everyone involved, from the actors to the tea ladies, everyone was treated with the greatest respect and when you talk about being involved everyone is interested. It can be equated to working for Vogue if you are a model. A funny story is that we had just had the Leicester premiere of Spy and I was out shopping and the supermarket had an offer on a loo paper, as I'm a one for a bargain I grabbed all the loo paper. I could feel somebody looking at me from behind, I stopped and he came up to me and said it is Caroline Munro isn't so I said yes, he told me he was at the premiere and we discussed the film. He then asked me why was I shopping, and I said because I need bits, he said don't you have someone to shop for you! It's just a strange thing how people perceive you when you have done a Bond film. I still shop for my own loo paper by the way! Career wise my roles since Bond have been quite diverse I haven't been typed cast, I think Bond women are strong, particularly my character who was certainly her own women. Can you tell us about "OMEGA" the Dr Who Play you have been involved in? I did that really recently with Peter Davidson, it was a wonderful very wordy play and was a challenge to do, as I'm dyslexic, but I loved every minute of it, I think sometimes being Dyslexic is an asset as you are continually trying to push boundaries to prove to yourself and others that you can do it. I had very good reviews for the play which was wonderful as I was judged totally for my acting skills and not at all on how I or my character looked. I am at my happiest when I am working and would love to do more, especially a soap, the calibre of acting in soaps in England is so good now I would love to get my teeth into a good character role. I played Naomi in the Spy who Loved Me. The Spy Who Loved Me and Dr No. Roger Moore for his line delivery and Sean for his sexuality. Ha ha all of us! Ursula coming out of the water.